You may prefer screw caps, you may prefer corks. Either way, you probably drink wines with cork closures some of the time, which leaves you with what we like to call, “cork leftovers.” We’ve gathered some pretty fun things to do with those corks, should you save enough up to get crafty. From Reindeer to wreaths, there are very cool and crafty ornaments you can make with those corks. Just some glue, pipe cleaners and googlie eyes can get you a great cork reindeer! If you stand the cork upright, you can put a slit in the top that you can slide cards into – it can hold place cards for weddings (have seen this done), holiday cards if the cork is sturdy enough, or other decorations (maybe a piece of art from your kids). 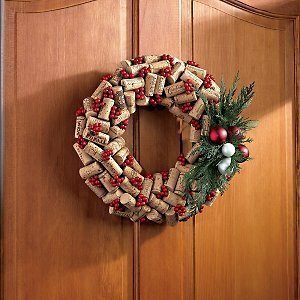 Big or small, you can put your corks together to make a beautiful wreath. You can include ribbons or bows, but no doubt, it’s a cork wreath.